China will continue to promote the development of Christian theology and establish a Chinese Christian theology, a top religious affairs official said on Tuesday. "Over the past decades, the Protestant churches in China have developed very quickly with the implementation of the country's religious policy. In the future, we will continue to boost the development of Christianity in China," said Wang Zuoan, director of the State Administration for Religious Affairs. Wang said Chinese Christian theology should be compatible with the country's path of socialism. "The construction of Chinese Christian theology should adapt to China's national condition and integrate with Chinese culture," Wang said at a seminar on the Sinicization of Christianity in Shanghai, part of an event to celebrate the 60th anniversary of the founding of the National Committee of the Three-Self Patriotic Movement of the Protestant Churches in China. Figures disclosed at the seminars showed that China now has about 23 million to 40 million Protestants, 1.7 to 2.9 percent of the total population. Each year, about 500,000 people are baptized as Protestants. According to the State Administration for Religious Affairs in 2012, the country has about 139,000 approved religious places. Among them, there are about 56,000 Christian churches and gathering sites. By the end of last year, the country had published 65 million copies of the Bible, including editions in minority languages. Additionally, China has 22 theological seminaries across the country. "Chinese Protestantism's theological education, literature publishing, research, social services and foreign affairs have seen great development. 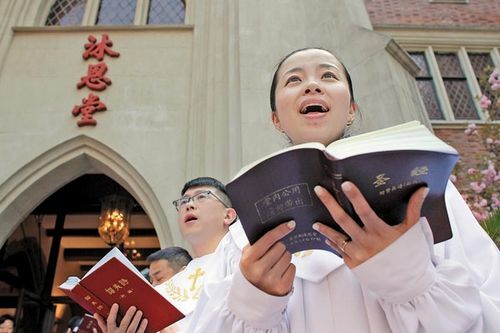 Over the past years, China's Protestantism has become one of the fastest growing universal churches," said Gao Feng, president of the China Christian Council. A five-year campaign to promote Christian theology in China, launched in 2013, will provide theological guidance for church rostrums in China and will promote the positive and correct theological thinking with a range of publications, exchanges, discussions and evangelism. The theological exchange campaign encourages more pastors, priests, believers and church volunteers to extract morals that are in line with the trend of the times from the Bible and other religious doctrines, said Gu Mengfei, deputy secretary-general of the National Committee of the Three-Self Patriotic Movement of the Protestant Churches in China. "This will encourage more believers to make contributions to the country's harmonious social progress, cultural prosperity and economic development," Gu said. 1Yunnan Ludian earthquake feature: Dear son, I’m so sorry! 3What could happen to MH17 after it was hit?